Books & other thoughts: It's all Greek to me. Really. I can't honestly say that we've been given any that were this bad, but some books have come close. Anyway, the above book sat in a closet in France for years and years. Ostensibly an old prayer book, it also had faint Greek markings running up and down the pages beneath the Christian prayer text. The family that owned the book took it to Christie's to see if it was worth anything, and it was auctioned off for two million dollars! Turned out that the Greek pages beneath the prayers were the only surviving copy of two manuscripts written by Archimedes. This happened back in 1998, and it has taken nine years for researchers to uncover the text and diagrams hidden under the writing. And they have discovered that Archimedes "was working out principles that, centuries later, would form the heart of calculus and that he had a more sophisticated understanding of the concept of infinity than anyone had realized." This Science News article will tell you much more about the story and the mathematical principles involved (which are all Greek to me, as I successfully managed to avoid calculus my entire life, ignoramus that I am). 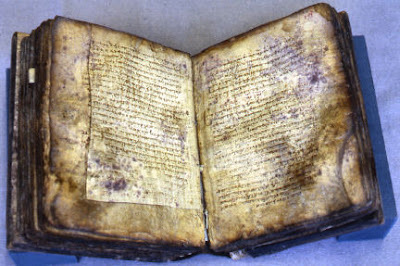 There are also some very cool photographs of the manuscript and how researchers managed to reveal words that a monk in need of paper erased so long ago. That's a fascinating article (even though I am completely ignorant of calculus too). It's so cool how they managed to decipher such an old text. As for people donating books wet with sewer water... well, sometimes I get the sneaking suspicion that common sense isn't all that common. That would be so cool, I could totally use 2 million dollars. Nymeth - sometimes I think that people just can't bear to throw books away, no matter what. When I first started dealing with the donations I found it hard to throw them away, even the cruddy ones. I've become more ruthless, but it always makes me a bit sad. That musty smell is one that stays with you. I could smell it just from looking at that picture. Ha! do you ever check out Found Magazine? you can visit their site at www.found.com. that story is terribly cool. but i have to admit, I love finding people's unknown treasures. Oh, no, I haven't - thanks for the tip!